Looking to have a new boiler installed? UK law states that all boiler installations must be carried out by a Gas Safe Registered engineer. 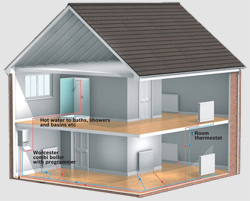 SR Coates Plumbing and Heating have the knowledge, experience and qualifications to ensure that your central heating system is installed safely and to a high professional standard. We have the expertise and manpower to install boilers or a complete central heating system – all at cost-effective prices. SR Coates Plumbing and Heating are also more than happy to offer customers free advice, on things such as which type of boiler to choose. There are various types of boilers to choose from including conventional and combi boilers, we will help you decide which one will best suit your budget, lifestyle and existing property’s setup. There are also a number of energy efficient products available on the market. A modern heating system can reduce your carbon footprint and save you money in the long-run, contact us to find out more. Worcester Bosch boilers fitted by us have manufacturers’ 10-year warranty. We offer a friendly, reliable and above all cost-effective service. 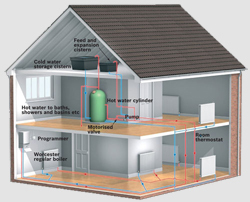 Energy efficient systems to save you money. Call us today on 07850399148 for more information on our gas, heating and plumbing services in Oxford and surrounding.